The Native American History begins long before explorers came to North America. There were many different geographically and socially groups that are believed to be ancestors of the nomads that traveled to North America via a land bridge that was at one time across the Bering Strait around 13,000 years ago. No matter what tribe the man were protectors, warriors, and hunters while the women of the tribe cared for the home, children and farmed. There were differences according to the tribe as some of the men were also the ones that did the artwork, weaved blankets, and baskets. 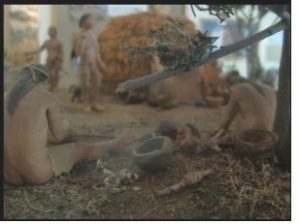 The food that was consumed was from the foods that the hunters came upon such as certain birds, fish, buffalo, and deer. The women grew beans, corn, squash, and melons while they also gathered berries and nuts. Berries were also used as dyes instead of for consumption. Most American’s have always been fascinated by American Indians and their culture. The truth about the culture of every American Indian is their deep connection with the earth, the beautiful artwork that is created, and even the clothing they wear, mainly for specific ceremonies. All Native American Indians throughout history had strong spiritual beliefs and do today. They believe in a higher power often called a Great Spirit. They also believe in using the resources from the earth that were given to them by the Great Spirit. Native Americans also believe in giving back to the earth. Shamans in every tribe according to Native Americans actually communicate with the Great Spirit that aids in guiding the Native Indians in the directions their life should go. It is very important that children today learn about the culture and history of Native American’s. Today, it is becoming harder and harder for schools as the books being created are leaving out much of our true history including the trials and tribulations of the American Indians and the battles when foreigners came to their land and killed the Native Americans to take over their land and even placed them on reservations. During the 1800’s and 1900’s Native American Indians fought to keep their land all across the United States. Several different US presidents created laws that all of the Native Indians should be removed which one of the most important historical events of American Indians is known as the Trail of Tears. Many Native American Indians instead of following their beliefs began to adopt the ways of the Europeans including their Christian beliefs and the clothing they were. At this time, there are still 560 Native American tribes that are federally recognized in the United States. Today, we just do not consider the sculptures, paintings, blankets, and baskets as artwork created by the Native Americans but also many of the attire they wore in the past and even today. This includes the moccasin with the unique beadwork as well as the headdress of the chiefs and more.